Muxlab 500756-RX är en mottagare för att ta emot 3G-SDI och RS-232 över ett nätverk från en eller flera sändare ( mottagaren kan bara ta emot ifrån en sändare åt gången ). Denna mottagare är designad att arbeta med en PoE ethernet switch. Om man inte har en PoE switch så krävs en separat strömförsörjare (500993). 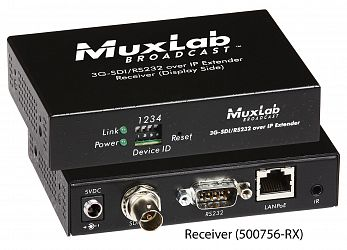 The MuxLab 500756 – 3G-SDI /RS232 over IP Extender with PoE allows easy extension and distribution of broadcast quality SDI, HD-SDI or 3G-SDI video with embedded audio over local area networks (LAN). This low-latency and versatile extender kit consists of individual transmitter and receiver units which can be configured in a variety of combinations. It is a cost effective alternative to a dedicated SDI matrix switch. 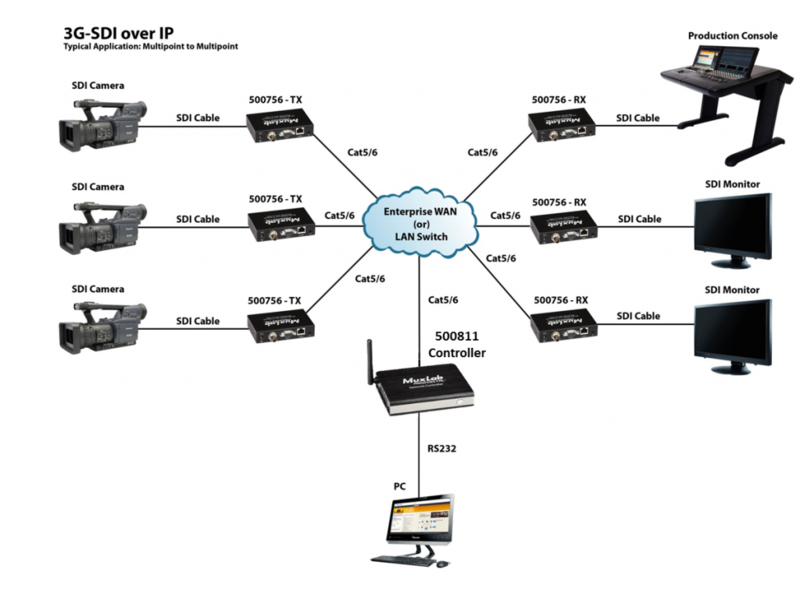 The 3G-SDI over IP extender allows users to send any SDI signals over CAT5/6 cable infrastructure instead of using the traditional SDI coax infrastructure, saving cable cost and making installation easy and fast. This extender kit is ideal for many quality critical video/audio applications such as original video source contribution, live video delivery around the broadcast facility or running media exchanges between different studios within the facility. Note: This device supports PoE (PD), and is intended to be powered via a PoE (PSE) Ethernet Switch. If a PoE (PSE) Ethernet Switch is unavailable, then the power supply (500993) may be purchased separately.